This article was first published in the trade journal “Soundings” Aug 2009. This is a biannual publication produced by The Institute of Musical Instrument Technology I.M.I.T. It received lots of attention at the time and I have been persuaded to reproduce the article as a blog. Although this type of ergonomic guitar has limited appeal for a lot of guitarists I think that most readers will find an interest in the manufacture and construction techniques. Some of the images/diagrams have been uploaded direct from the original article, apologies for the quality. 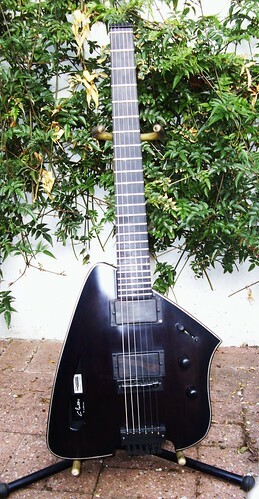 Early 2008 a regular customer to the workshop and a Steinberger Guitar enthusiast approached me about having an electric guitar made. On closer enquiry I soon realised this was not to be the regular “run of the mill” design. Although some of the above is standard form, the shape and overall appearance was to be quite dramatically different. The construction methods needed to complete this job were to lead me away from the norm. The customer, who has a background in graphic design, was soon able to supply me with a full size card mock up of the shape and approximate size of the guitar. I was then presented with the problem of translating the card mock up into a working drawing and making it work, as a guitar, on paper. Over the course of a month or so the hardware needed was researched and acquired. The hardware is vital if an accurate and successful drawing is to be produced. Over a few weeks, and when time would allow, a full size orthographic drawing was created and all constructional problems ironed out. If it works on paper we can build it! During 2006 I had acquired some reclaimed Brazilian mahogany from a furniture maker friend, Dan Burrough http://www.tree-fish.net/, (based in Wiltshire). The reclaimed mahogany was taken from two very large panel doors (12’ x 6’) that were being replaced in a 1930s Water Authority Pumping Station. The mahogany was structurally sound and would have probably ended up in a skip or on a bonfire if it had not been for Dan. After taking out the usable wood, and too small for any significant furniture making use, it was to prove just right for this project. It was lightweight and there was enough thickness in the door panel for a two piece back and carved top. Part of the frame of the door was to become the neck. The ebony fingerboard was to be from stock. The edge binding for the body was purchased from a silversmith in the West Midlands. From the full size drawing relevant templates were made up. Two sections of the mahogany were joined together (50mm in thickness). This made up the back and the sides of the guitar. The body was hollowed out using a router, 45mm deep, thus creating a 5mm thickness back and 20mm wall around the shape. 3 (already joined) pieces of mahogany from a door panel (approx 18mm thick) made up the top. The top was shaped and carved using brass thumb planes. This is the same technique as used in violin making. The unusual shape of the guitar top dictated that this same shape be “echoed” in the contour. The centre of the shape was finished to 15mm and the edge of the shape was finished at 5mm. The next process was to cut a rebate for the silver binding. Traditionally guitar edge bindings are either wooden or celluloid. This guitar’s binding was to be solid silver. I didn’t know how well this would work. After a few test pieces I decided that an epoxy resin would be the safest glue to use. A line of silver binding was glued into place followed by a line of ebony (approx 1.5mm thick) which would become the finished bevelled outer edge. When finished the silver line would appear to be embedded into the top. Upon completion of the body and binding, work started on the neck and fingerboard. Most players prefer their guitar neck profile to be as thin and as “slinky” as possible. This usually makes for a comfortable hand playing position. However, in some circumstances it benefits the player to have a rounder neck profile. This is generally so when the player has a problem with their fretting hand due to injury or muscle problems. The client had suffered for several years with thumb tendonitis brought on by over extending the hand whilst playing. 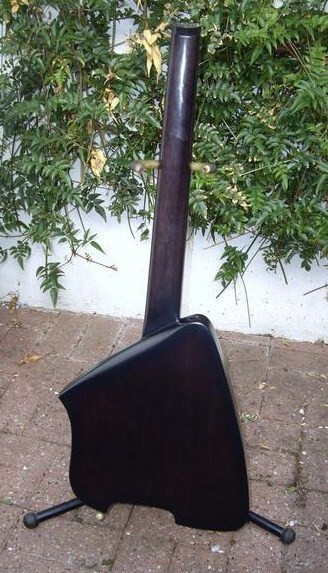 As part of the design spec the profile of the neck was to be unusual. That is, to be round in shape rather more like a baseball bat than the normal shape of a guitar neck. 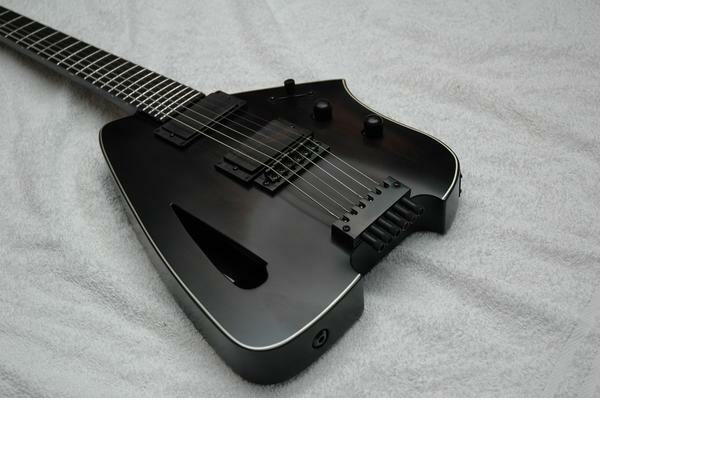 The fingerboard would be ebony with stainless steel frets and silver neck side inlays. The 10mm channel was routed for the truss rod (the adjustable steel rod that runs the length of the neck underneath the fingerboard). With the two major components made the next stage of the build is to create an opening in the body to house the neck. The rake angle of the neck is inclined at 3° to the horizontal. This angle (common on many Gibson style electric guitars) gives a good final string high and string tension needed for optimum playability. A jig was made up to allow a router to cut an opening 25mm deep, the width of the neck and at an angle of 3°. Once the neck channel was completed, the neck was glued into place. Using a G-clamp it was clamped up and left overnight to cure thoroughly. All that remained of the woodwork was to clean up and sand down the grades finishing with 320 grit garnet paper. The fingerboard was masked off and the guitar was now ready for the finish. It had been decided to finish the guitar in a translucent black so as to reveal the brown of the mahogany rather than a solid colour. 3 base coats of polyester were applied then followed by several coats of diluted black nitrous cellulose. It was then finished with a nitrous cellulose satin clear top coat. This gave the guitar its stylish modern look. All that remained was to add the hardware and set the guitar up. 2. Straight line at end of guitar enables it to stand without aid. 4. Curve design to fit into the shape of the player’s leg when seated. 1. The upper solid section to support the neck. Wow. Everything we ever dreamed of at college in terms of a comission. Finishing etc looks fab. With talk of redundancies in education I may be joining the professional Luthier ranks – but have 23 years to catch up on…..
pic of you or someone holding it would be nice.